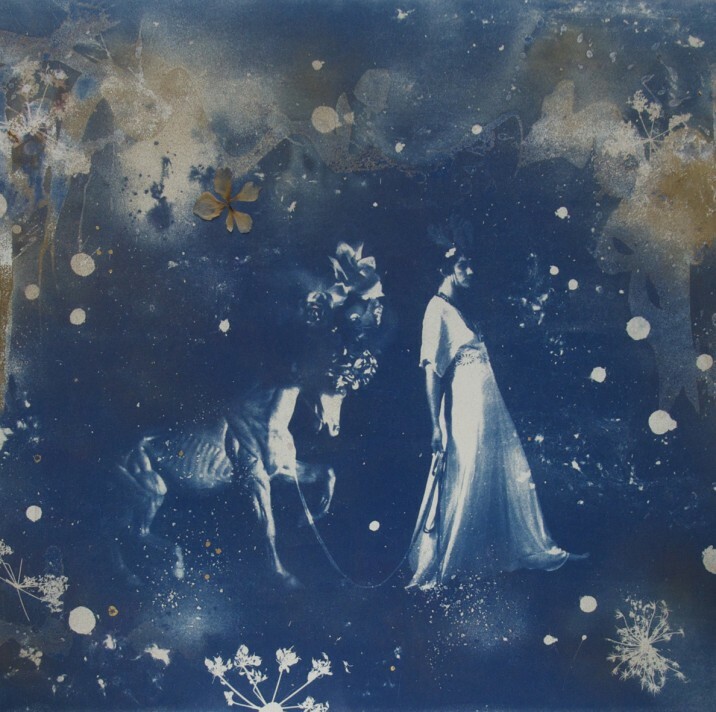 Hand painted Cyanotype finished with flowers and gold leaf on paper, 112 x 75 cm. Every quarter ACS interviews one of its members for the ‘Artist Spotlight’ section. This quarter Rosie Emerson talks about her practice, inspiration and passion for art. A. Currently I work with both screen-print and an alternative photography technique producing cyanotypes. I often hand paint and gild with gold leaf too. A. Nature, stories, poetry, architecture, religious shrines… I love visiting museums. The V&A and the Wallace Collection are two of my favourites here in London, and the Uffizi in Florence for its collection of medieval art, Lorenzetti and Botticelli in particular. I like the unusually-shaped shrine-like canvases of the works, originally designed for church rather than gallery environments. I have developed circular and arch-shaped cyanotypes in response. A. I often work on several pieces at once, it allows me time and space to come back and see the work in progress with fresher eyes. I start with an idea which can be either quite loose or quite specific, the first stage after that is usually finding a model, preparing costumes, and props. I often make things for my shoots too, the photo shoot will happen under studio lights in my live work space in Hackney Wick. I do the hair and make-up on the day. The next stage can vary depending on what piece I’m making. In ‘Parade’ for example, I have photographed the model and also photographed a statuette of a horse. The two photographs are then combined on the computer to create one image, which is then made into a real size negative. I used Somerset Satin 30 gsm printmaking paper, which I hand-painted before coating in a light sensitive photographic emulsion, and then left to dry overnight. Next, the magical bit happened, the real size negative was placed on the paper alongside, in this case, flowers, salt, seed heads or anything I have chosen to create a negative silhouette on the work, and the photo was exposed either under direct sunlight or in a UV exposure unit. The piece was then rinsed for 10- 20 minutes in water, and then carefully stretched on board. Once dry, the photo was hand finished with gold leaf. ‘Parade’ was produced for the exhibition ‘ Good Figures’ at Mall Galleries. The exhibition is currently on tour and showing at the Jerwood Downland centre in Sussex. A. I have always drawn and painted, and I am luckily enough to come from a creative family. At school, being dyslexic, the art room was important because art was something I could do, where I could express myself with eloquence. I discovered photography at 19, on my foundation year at Bournemouth Arts Institute, and collage later at Kingston University. It was here I started to combine photography with printmaking, screen printing and etching with the hand painted. A few years after Kingston I completed my ‘ Models’ series, this was when I think I found my own artistic language.